Posted 6/30/2018 12:32pm by Josie Hart. This week we'll start pulling our earliest variety of garlic, Tempico Rojo. It is a smaller variety but packs a punch, with purple stripes and purple wrappers on the cloves. These are fresh, not cured like our main season garlic, so keep it in the fridge if you don't use it right away. We'll have one more week of cherries for the Fruit Share, and then a little break until early peaches come on. Using the largest size holes on a box grater, grate the carrot, kohlrabi and apple into a large bowl (watch your knuckles!). Toss with parsley, oil, vinegar, mustard, lemon juice, salt and pepper. Serve! Posted 6/26/2018 5:24pm by Josie Hart. We are excited to start the flower share a little early this year! Today or next Thursday you will receive your first flowers. For folks picking up today, you will get one bunch of snap dragons, one bunch calendula, 2 asparagus ferns and one perennial stalk. As we get more into the season, we will increase the amount of flowers you will get in your share. The flower share this year is more of a "DIY" share. We will give you a variety of pre-bunched flowers and you can build your own bouquet when you get home. Each week, you will receive a mix of foliage (asparagus fern) different colors and varieties of flowers and some "fillers" like perennial yarrow or bee balm, etc. to fill out your bouquet. Make sure to put your flowers in water when you get home and change the water daily so your fresh cuts last a week or more. Please email me if you have questions about your flowers. You will pick up every other week - so today is our first Tuesday and next week will be our first Thursday. Posted 6/16/2018 12:12pm by Josie Hart. Our main focus however is on growing strong and healthy plants which will not be as susceptible to insect damage, and more likely to withstand serious injury when insects do find them. Below are some thoughts from Katie regarding exactly how insects find the plants they like to feed on (we have a lot of time together out in the fields to speculate on all sorts of topics!). At Chatfield we work throughout the season to minimize the damage done to crops by common pests such as flea beetles, cucumber beetles, and squash bugs. Such pests are ones that farmers and gardeners alike struggle to control year after year. If you face this issue, and you’re like me, you may wonder where these pests come from and how they locate the specific crops that they feed on. A squash bug, for example, won’t go after crops that aren’t members of the cucurbit family, such as squash, melons, and cucumbers. So how do pests locate the right crop? It is believed that insects use chemical smell and taste cues to recognize plants, and that the insects can distinguish between plants based on their differing tastes and odors, determining the plant’s appeal to different insects. Scientists also argue that visual cues play a role in pests’ location of their host plants. Phytophagous, or plant-feeding, insects are drawn to green things like leaves. Only after pests visually locates a crop will they use their chemical cues to determine whether or not they have landed on the right plant for them. Therefore, while bugs may use three different senses in conjunction with one another to complete the process of invading a plant, they must use them in proper order, and cannot use their chemical smell and tasting cues to direct themselves to crops on the other side of a field. Only once they’ve landed on a plant are they able to identify it. Pests like squash bugs overwinter as adults under crop debris, soil clods, and rocks in fields that they’ve occupied the previous season. Squash bugs emerge in the spring, using their cucurbit hosts as a feeding and mating grounds. If crops aren’t rotated through different fields each season, the bugs have a much easier time locating and destroying plants right off the bat. So the next time you find that an insect is feeding on the leaves of plants in your garden or on your crops, remind yourself that insects have amazing capabilities, and that produce with imperfections will still nourish you! Grate carrots. Combine with olive oil, raisins, lemon juice, and mint. Season with salt and pepper, toss to combine well, and serve! Posted 6/9/2018 3:00pm by Josie Hart. This week we've got garlic scapes coming on. Scapes are the curly, tender green stems that shoot out from hardneck garlic plants and would eventually flower if we didn't pick them. By harvesting them, we redirect energy back down into the bulb as it matures. Scapes can be used in place of garlic in any recipe, or can be roasted or grilled by themselves. As we wait for peas to bounce back (they just started flowering now), with broccoli munched, and two seedings of spinach seeing poor germination in the dry and heat we'll be a little lighter than usual in number of crops for the next few weeks. Thank you for sharing in the successes and failures which happen in the course of a farm season! This is my go-to kale preparation for summertime. "Massaging" the kale turns it dark green, as if its been cooked, and the avocado and toasted nuts add creaminess and crunchiness to the dish. Salty, sweet, creamy, crunchy ... YES! Chop the kale very finely and put it in a large salad bowl. Combine olive oil, soy sauce, lime, vinegar, garlic, salt, pepper. Use your hands to vigorously mix it all together, for just a little while longer than you think necessary, maybe 2 minutes. Place in the fridge for about half an hour. Toast up some almond slices (or other nut) in a hot dry pan until just browned. Add avocado and nuts to the bowl just before serving. Posted 6/2/2018 1:26pm by Josie Hart. Broccoli raab, or rabe, or rapini is a relative of broccoli that is popular in southern Italy. The leaves, flower buds and upper part of the stem are all tender and edible. Like many Italian vegetables, it does have some bitterness. Cooking it with garlic, lemon and white wine mellows the sharpness of the raab. This is how I like to prepare it, with the white wine and sausage taking it from a humble peasant meal to a rather luxurious one! Heat the oil in a large saucepan over medium heat. Add the sausage and cook, breaking it up with a spoon, until it’s no longer pink, 5 to 6 minutes. Add the broth or wine, parmesan, lemon and red pepper and simmer. Add the broccoli rabe cook until tender, 3 to 4 minutes. Drain the pasta of most of its cooking water and toss the pasta with the sausage mixture. Add salt and pepper to taste. Egg, mushroom and self-care shares will begin this week. Eggs and mushrooms will be weekly, and the self-care share every other week. Posted 5/4/2018 6:03pm by Josie Hart. I hope you're looking forward to getting the season started as much as we are! Weather permitting, we'll be starting distributions the week of May 29 and 31. *Supporting Shareholders will have a special pickup and details will be out this weekend as the share box is still being curated. Supporting shareholders are the kind folks that paid more for their full shares and get extra produce throughout the season. Katie: I'm from northern Idaho but I've lived in Denver for the past four years and am a recent graduate from DU. I've spent the last few years working for various farming and urban agriculture organizations and I'm excited to be at Chatfield Farms for the season. Adam: Originally from Georgia, I first came to Colorado in pursuit of the ski slopes. I worked in an office for many years and knew that it wasn't a fit. I decided to make a switch to farming and haven't looked back. Chloe: Hi! This is my first season farming at Chatfield. I enjoy harvesting beets, visiting the farm animals and eating fresh strawberries. I can't wait to try some new recipes with all the veggies we are going to grow this year! Maddy: I grew up in Maine helping in my family's veggie and flower gardens. I've spent the last three seasons farming in Boulder, Denver and in my home state. Like my spirit vegetable, the carrot, I love to spend the majority of my time in the dirt! Royce: I started gardening as a child at my great grandparents' homestead and now I operate my own small urban farm in southwest Denver. In my free time I like fly fishing and mountain biking. We'll be seeing you at CSA pick-ups soon! Posted 4/2/2018 11:52am by Josie Hart. We are excited about the prospect of rain or snow recently; the more moisture we get now, the better our season will be. The early March and April field work is coming along, and we have planted our snap peas! We have new farm partners that will be offering great products to you this year: Pasture Provisions and Hampden Farms. Pasture Provisions is proud to be participating in Denver Botanic Gardens Chatfield Farms CSA for the 2018 season. 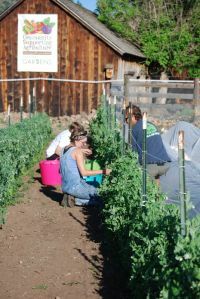 Shareholders of the Chatfield CSA will have the opportunity to sign up for a meat share that will include pick-ups every other week for both Denver Botanic Gardens on Tuesdays and Chatfield Farms on Thursdays. Click on the links below for more information. Each basket’s contents are hand-selected based on the availability and seasonality of the products we source from our partner ranches and farms. All of our meat products are USDA-inspected and processed in USDA licensed facilities. Products are stored in certified frozen food storage facilities and handled using food safety best practices. Please notify us of any packaging that is torn or pierced and we’ll replace that product at no charge. Please see links for proper storage and meat thawing instructions. Gift yourself or a friend with a self-care share! Every other week of the CSA you will pick up fresh, handmade, botanical bath products. You are supporting our Veterans to Farmers program by taking care of you! EGGS: When you purchased a vegetable share did you see the option to purchase eggs with it? Eggs are now available through our website. Each week you will pick up a dozen free range eggs - 20 weeks for $120. We are getting more excited as the days get longer, the soil warms up, the robins and hawks build their nests and all the transplants grow a little each day! Posted 3/9/2018 2:22pm by Josie Hart. Happy Spring! We have the first crocus up all over the farm and some new tiny plants still tucked away in our greenhouse! Our shares are sold out for the season and now we are rolling! We would first like to welcome you all to our CSA. Returning members and first-time members alike, each season brings much hope and excitement. Our onion plants are popping up in our greenhouse and they look very happy - red, white and yellow varieties. Self Care Share $15, every other week available now! You work hard, treat yourself or someone special to a relaxing time. Each self-care share comes with 3 items: a salt or sugar based scrub, a botanic bath soak, and a whipped lotion. Throughout the share, freshly harvested local flowers and herbs (lavender, calendula, etc) will be incorporated into the products. Our egg share is back for another year with a new producer. Amish Acres out of Westcliff Colorado. Mushroom Shares $120 still available with two types - the standard share and the deluxe share that includes a T-shirt and grow kit. Fruit Shares are still available! To purchase additional shares, click here or log into your account from the homepage. We are working on improvements to our washstand after attending a new Food Safety Modernization Act training this winter. We take food safety very seriously at Chatfield Farms and our staff was grateful for all the new and reviewed information. Attending training's and making important capital improvements is just a part of what we do during the winter at the farm. We also complete our crop planning, seed ordering, financial planning, create program budgets and support our Advanced Veterans Winter Session. Posted 1/29/2018 5:51pm by Josie Hart. Now is the time to sign up for the 2018 Chatfield CSA! Starting Feb. 1st you can head to our website homepage and select the link "sign up now" or you can use the link at the bottom of this email. Please note mushrooms, fruit, flowers and vegetables are all on sale right now but we may add a few more share options as they become available - including the popular egg share and the new "self care share". Our egg producer has not confirmed available shares yet for this coming season but we will keep you in the loop when they do. You can choose to pay for your shares all at once or break them into automatic monthly payments. You will need to select one distribution location that works for you for the season. Please keep in mind that the times for distributions are set and don't change week to week. At York St. we start at 4 pm and Chatfield starts at 3:30 pm. Please remember to bring your own bags to reduce plastic. We strive to be zero waste and we are not allowed to give you recycled plastic bags due to food safety standards. When you bring your produce home, please thoroughly wash all produce with cool, running water and let it dry before storing it in an air tight container. We are planning on starting up distributions on May 29 and May 31, depending on the weather in the weeks leading up to those dates. Thanks so much! We are so excited to get our hands in the dirt and to have you be a part of our community. Posted 1/2/2018 11:32am by Josie Hart. It's that time again! Vegetable, flower, egg, mushroom and fruit shares are available now for the 2018 Chatfield Farms CSA season.